CarGurus has 2,686 nationwide Cooper Clubman listings starting at $2,700. What’s bigger than its older brother, but not as big as its younger sibling? 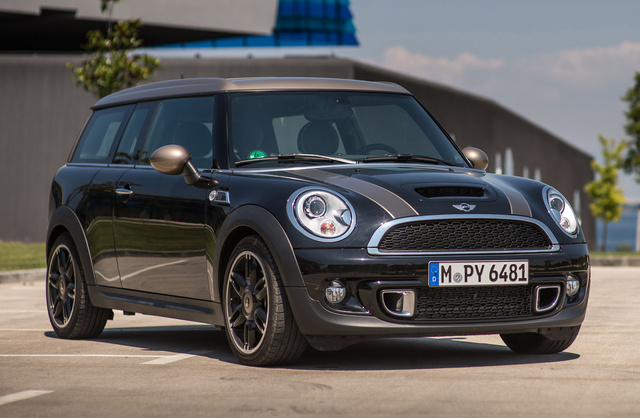 The British-designed, German-powered (BMW) 2014 MINI Cooper Clubman is expected to remain some 9 inches longer than its original MINI Cooper hard-top progenitor, but offers 6 fewer inches of length than its 2-year-old Paceman stablemate. Things could change, however, as a complete redesign, including new powerplants, exterior and interior tweaks, and the introduction of a couple of all-new vehicles is looked for in the MINI lineup for either 2014 or 2015, though the folks at BMW (proud owners of the MINI line since 2000) are keeping traditionally mum on the release of details and timing. Should the aforementioned redesign end up being delayed till 2015, it’s expected the 2014 edition of the 3-door, 4-passenger Clubman hatchback will reflect few changes from last year’s version. Three trims, the entry-level Base Clubman, the turbocharged S and the track-proven John Cooper Works (JCW), ought once again to be offered with front-wheel drive (FWD) and sporting the unique and infinitely customizable profile and cabin features that have made this oddball commuter car a hit here across the pond. One of this unique little hatchback’s more endearing features is a reverse-opening passenger-side rear door that makes loading cargo and passengers a bit easier than it is with other MINI offerings. And speaking of cargo, look for a total of 32.8 cubic feet of hauling space with the rear seatback folded. The S and JCW trims each boast turbocharged 4-cylinder power and performance, while the Base trim should pack the variable-valve-timed (VVT), normally aspirated 1.6-liter inline 4-cylinder (I4) powerplant that’s long on fuel efficiency but a tad short on neck-snapping acceleration. Assuming this under-achieving four-banger remains with the Base trim for 2014, it’ll once again put out 121 hp and 114 lb-ft of torque when mated with either the standard 6-speed manual transmission or the available 6-speed shiftable automatic transmission. Mileage estimates of 27 mpg city/35 highway, however, might go a long way toward mitigating a pokey 10-second 0-60 time. The Clubman S ups the Base trim’s power ante with a turbocharged version of the 1.6-liter I4. Again managed by either the standard 6-speed stick shift or the available 6-speed shiftable automatic, this anticipated powerplant will throw down 181 hp and 177 lb-ft of torque, with mileage figures in the realm of 27/35 for the manual-transmission version and 26/34 for the automatic-toting trim. Bred from the Grand-Prix-notable John Cooper Works racing division, the 2014 Clubman JCW should again pack the 1.6-liter I4 engine with a twin-scroll turbocharger that works itself up to 200 hp and 192 lb-ft of torque, again under the supervision of the standard 6-speed manual transmission or the optional 6-speed shiftable automatic. With the twin-scrolled turbo’s added boost, look for up to 207 lb-ft of torque to be tossed out, with fuel economy numbers of 26/35 in the stick-shift version and 26/34 in the automatic-toting variant. Appearance- and creature-comfort-wise, the 2014 Base Clubman will, if remaining true to last year’s specs, carry standard 15-inch alloy wheels mounting performance tires, leatherette upholstery, a split-folding rear seatback and full power accessories. Cruise control will likely return, as should telescoping tilt-wheel steering, air conditioning, simulated alloy cabin accents, a leather-wrapped steering wheel, Bluetooth hands-free calling and a 6-speaker, single-CD-capable audio system. The Clubman S, it’s assumed, will add, besides the assumed blown four-banger and a stiffer suspension package, 16-inch alloy wheels with run-flat tires, sport front seats and alloy pedals, while the JCW is expected to once more flaunt 17-inch alloy wheels, upgraded Brembo brakes and attractive cloth upholstery. Options are expected to remain plentiful in the Clubman lineup, but will again add significantly to this little hatchback’s price tag. Nevertheless, in keeping with MINI’s tradition of limitless appearance and features choices, optional equipment should include a dual-pane power sunroof, rear parking sensors, heated front seats, boundless wheel upgrades, leather upholstery and a 10-speaker Harman Kardon premium Surround Sound audio system, with the further option of a satellite radio subscription. Also available to the S and JCW editions are a locking rear differential and/or a sport-tuned suspension, while all trims are eligible for an available navigation system, as well as MINI’s touted smartphone apps for limited wireless Internet capability. Assuming all things stay equal, standard safety equipment of note ought to include 4-wheel antilock brakes (ABS), traction and stability control, with the option of Dynamic Traction Control, front and rear head airbags, and front side-mounted airbags. A post-collision safety system should remain standard aboard all trims for 2014, as should front fog/driving lights in the S and JCW trims. Look for further optional safety equipment, meantime, to include adaptive xenon headlights and a remote antitheft alarm. What's your take on the 2014 MINI Cooper Clubman? 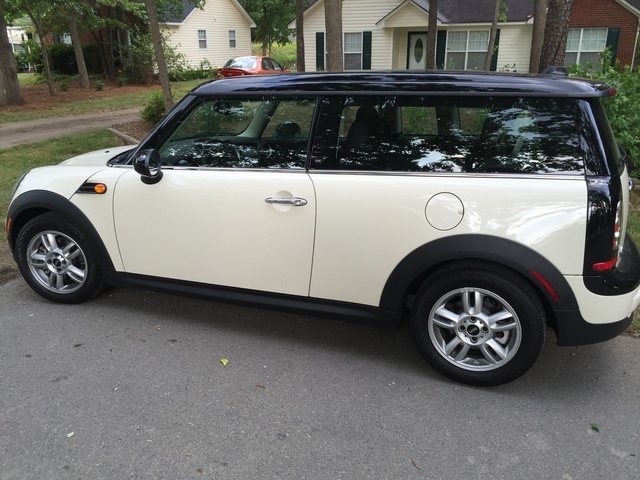 Have you driven a 2014 MINI Cooper Clubman?